Capital University combines personal attention with a balanced liberal arts and professional studies education to prepare students for lifelong learning, leadership and service through five colleges: College of Arts and Sciences; Conservatory of Music; Law School; School of Management; and School of Nursing. The university serves its adult learners through the Centers for Lifelong Learning in Cleveland, Columbus and Dayton. 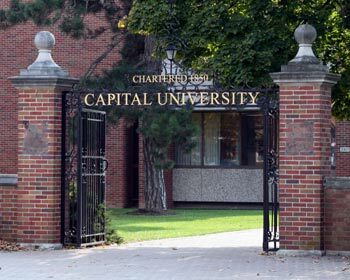 Capital is the oldest and largest university affiliated with the Evangelical Lutheran Church in America. The university has a current enrollment of approximately 3,850 undergraduate, graduate and professional students. The university actually began as a seminary in Canton, Ohio called the Theological Seminary of the Evangelical Lutheran Synod of Ohio. This was in 1830. Classes were taught in German and for the next 88 years only allowed men as students. In 1832 the seminary moved to Columbus after the city outbid Canton to house the seminary. In 1853 the university moved to 4 acres of land at North High Street and Goodale Avenue where it would remain for 23 years. In 1874, having outgrown the facilities on Goodale, the university accepted an offer of 50 acres east of Alum Creek, the present location of the university. In 1876 a caravan of horse-drawn wagons began the 4 mile trek to the new campus in Bexley. Capital University has an excellent reputation across the country for its Law School. The origins of this date back to 1903 when a small group formed the Columbus Law School. At the time it was just 1 of 14 lawn programs established across the country. A few years later, the Ohio Supreme Court gives recognition to the Columbus Law School. In 1923, after several name changes, the school moves into its own building at 40 East Long Street and becomes known as the Columbus College of Law. In 1966 the law school officially becomes part of Capital University and moves to the Bexley campus. In 1998, the school again moves to its own building at 303 E. Broad Street where it remains today.